Srila Prabhupada often referred to his disciples as "boys and girls," even though many of them were in their twenties and thirties (and even older). When Prabhupada visited the Toronto temple in 1976, I saw this statement come to life. 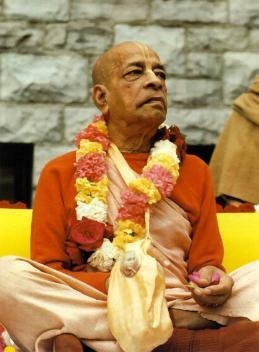 After his morning class, Srila Prabhupada would hand out cookies to the children. At the time, Ayodhyapati Prabhu was the head cook and he kindly prepared extra amounts. So one morning, after all the children had received prasadam from Prabhupada's own hand, there was an extra plate of cookies sitting beside his vyasasana. Srila Prabhupada saw them and then motioned to his leading disciples -- including visiting sannyasis and GBC members -- to come forward and accept a cookie just like the children had done before them. I could see the first leader hesitate for a brief second, but then he stepped forward and we all lined up to receive the mercy one by one. Everyone was completely satisfied. Srila Prabhupada, our eternal father, had once again displayed his causeless mercy to his "boys and girls."